Congrats for this extensive and exact article, Sabha! 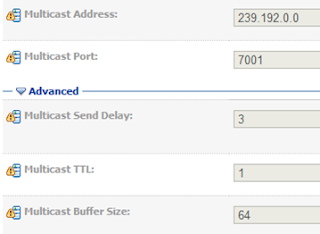 Any reasons why you wouldn't go with the default unicast and possibly define a unicast network channel on a Exalogic? Did you see any performance degradation with large UC cluster? I was running hundreds of MC cluster but the trend seems to go towards UC. Thanks Frank for your comments. To answer your question, I would have to create a new posting as there are lot more details to discuss. Thanks for your patience. Should have one soon :-).